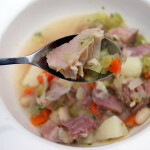 I love using a leftover holiday ham bone to make split pea soup, but I was in the mood for something a little different after Easter this year so I came up with this Potato, Ham and Bean soup. 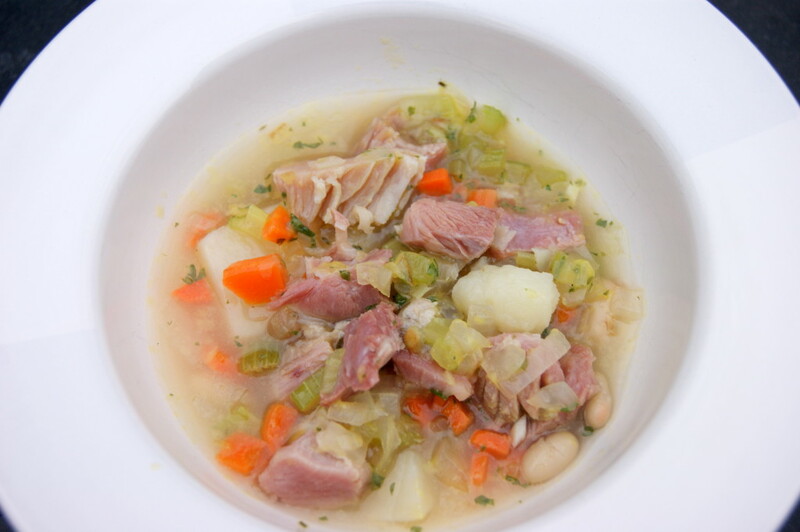 Simmering the ham bone in water transforms plain, old tap water into a richly flavored broth, which is deliciously rounded out with tender potatoes, creamy beans and smoky ham. Next time you find yourself with a ham bone on your hands, don’t toss it in the trash! 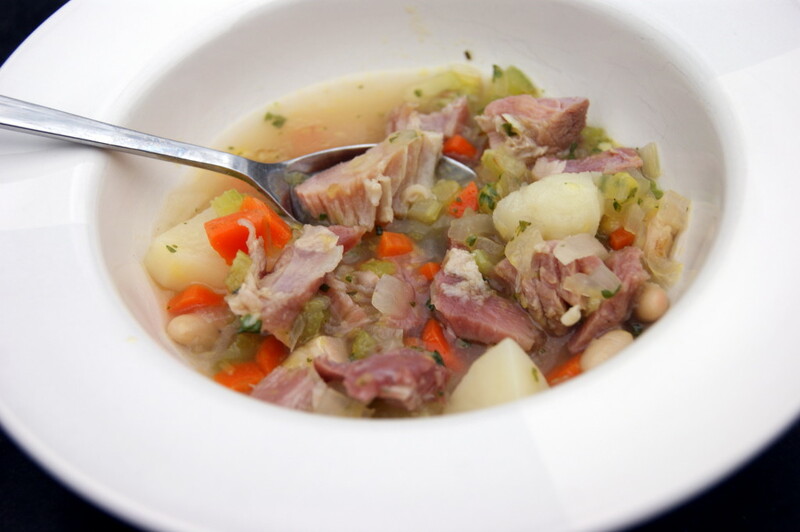 Use this simple recipe to make a delicious and hearty soup! 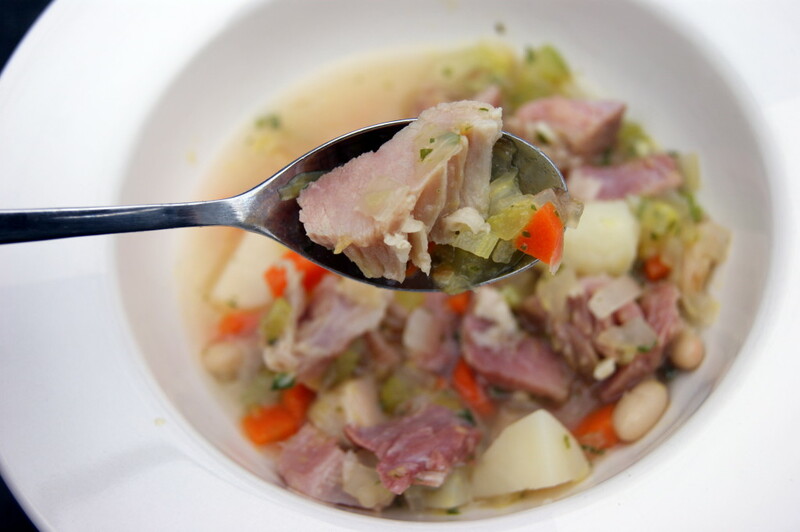 Place ham bone in a large soup pot and cover with water – about 12 cups. Meanwhile, add olive oil and butter to a large sauté pan over medium heat. When butter is melted, add onions, carrots, celery, garlic and parsley. Season with pinches of salt and freshly ground black pepper and cook for 7 – 8 minutes until everything softens. Remove about 1 cup of potatoes from the soup pot. Add potatoes and one can of beans to a blender. Blend until smooth. Remove ham bone from pot. Cut off excess ham, dice and discard bone. Add blended bean and potato mixture back to soup pot. Add ham and sauteed vegetables. Mix well, taste and season with pinches of salt and black pepper. Simmer for another 30 minutes until slightly thickened. Taste and adjust seasonings one more time before serving.